Usal is a subji with gravy made from pulses. 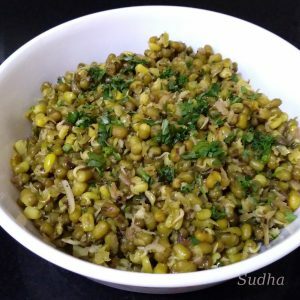 In Maharashtra, we make different types of Usal. Pulses being excellent source of proteins, these Usals are very healthy. They are very tasty as well. 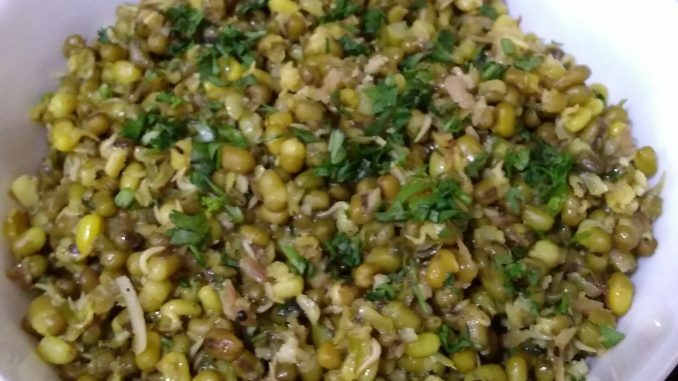 This recipe of Moong Usal does not use onion, garlic. 2. Drain them and wrap in thin towel, tie tightly and keep it in covered pan for 8 hours. 4. Roast the grated dried coconut (khobra) till light brown. Allow it to cool. 9. Add sprouted Moong, Sauté and cook covered for 2 minutes. Remove the lid, sauté and cook covered for 2 minutes. 10. Add water to cover half the moong; cook covered for 3-4 minutes. 11. Add crushed dried coconut, fresh grated coconut, jeera powder, aamchur, salt, sugar and cook covered till Moong are soft. Add water if required. 12. Add chopped coriander and serve hot with Roti (Indian Bread). If you want, you can add onions to this usal. It tastes nice. For this, finely chop 1 medium onion and add it to tempering/ tadka along with Moong in step 9 above.